On Wednesday 24th Oct, Medicine Horse Program rescued two stallions. One came with a name, Dakota, the other didn’t. I kept a training journal for the first week. Dakota is more curious, it took next to no time for him come up to me and to accept hay from my hand. The other one, whom we are yet to name, is much more shy. He is constantly looking for things to be afraid of, from a horse moving in a paddock far away, to a mouse rustling around in the hay. He hides behind Dakota peeking out to see what is happening, which is adorable. They are both in good body condition. Feet, not so great. I can’t wait to trim those. In the evening I took a handful of grain to spark curiosity and sat down in the pen and allowed them to explore me. They were both very interested in my hat. Even the little shy guy spent a lot of time gently sniffing my legs and arms. Sweet curiosity. If I kept still they slowly got closer and the curiosity snorts got quieter. Dakota led the way, with no-name mustang always behind him, peeking his little head from under Dakota’s belly or neck. Dakota had his first horse cookie. Not sure if he is impressed or not. We tried an apple but he didn’t really understand how to eat that. We also achieved some full minute scratches and my hand on his shoulder as he was eating hay towards the end of the day — with him actually relaxing under my fingers. Little No-Name was a bit braver today. Also ate a cookie out of my hand and gently explored my hand — but always from behind Dakota still. Little No-Name reminds me of a mouse so I wanted to call him Squeak. Thea assures me that isn’t an inspiring name for a horse. I’m sure she is right. I have a dog named “Werm” so I really should not be trusted to name any of the animals. 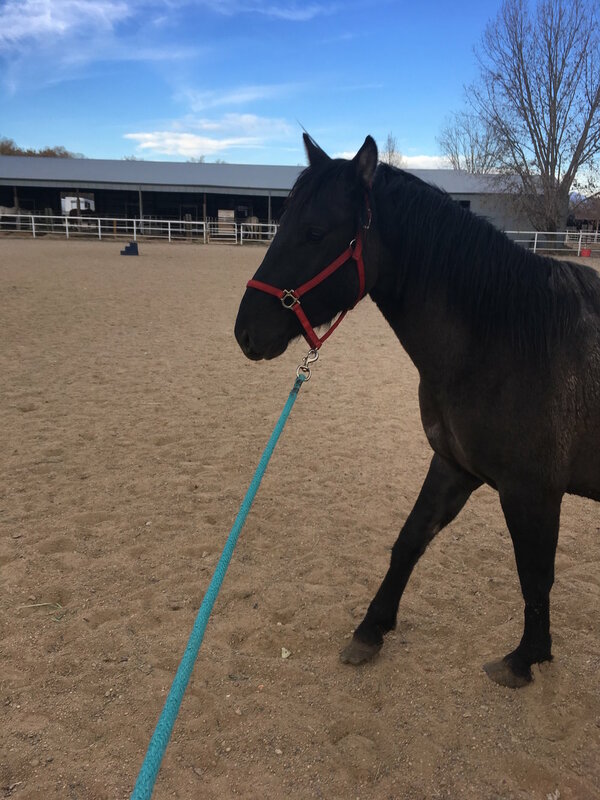 We’re going to put naming to the Medicine Horse Program community, asking for suggestions, then Thea will pick three, and we will put it to a vote. Established trust with Dakota, and he opened up immensely. I never have a method for how trust happens, it is usually a combination of time, playing games, scratches, stillness … But when that happens, there is a breakthrough in understanding. Understanding that I won’t harm. Understanding that I offer safety. When this trust happens, things will progress a lot faster. I never push a horse before I have this communication and trust established, as doing so would be unfair, and unsafe. We played with the halter — sniffing it, mouthing it. Dakota, when he realised it was a game, would push his nose into it and allow it to slide up and down his face. We also played with the rope over his neck. Lots of cuddles. The day resulted in him wearing a halter. He practically put it on himself. Started leading training with Dakota. This is the part of the process that most inspires gratitude within me towards our domesticated horses. Those day-to-day things I take for granted: haltering, leading, standing, tying up. Mostly leading. Have you ever tried to lead a wild horse? A horse that doesn’t understand that is what the rope is for. Doesn’t understand to follow. The most wonderful part is just how clear you have to be with your own communication. And every horse I have ever taught to lead is different, so it is not just about how I communicate what I am asking for, but how I adapt that communication in response to what the horse is asking. The day ended with him being led, calmly, out to a new stall. This is great news, because it means that Dakota and No-Name are now in separate stalls. Well, great news for me. No-Name may not think it is such great news now he can’t hide behind Dakota. Led Dakota out this morning to the roundpen. Started some basic roundpen training. Also put a saddle pad on him. The leading part was still sticky. Getting to the roundpen took time. But getting back was more fluid. The saddle pad produced a snort when it first appeared, but that was all. Dakota didn’t even flinch when I raised it onto his back. Now I have he and No-Name separate, I have started to be able to work with No-Name. He is very shy. But, he’s not half as upset as I thought he would be about being separate from Dakota. In many ways it has caused him to step up to the mark a little, and be braver. Dakota: more being led out — almost seamless now — and introducing brushes. Starting to touch down the legs. This is the first thing he has expressed that he has objections too. As soon as my hand goes below his shoulder, he doesn’t move away, but paws at the ground trying to shake my hand off. Not aggressively by any means. If I stay there he accepts the hand on his leg, his little ears flicking back and forth. Spent a lot of time with No-Name today. Touches. Trying to convince him I don’t bite. I got as far as scratches on his neck and face, but it is always prefaced with snorts, quivers, and flinching when I touch him. Only very short sessions with this little guy, as I don’t want to overwhealm him, but many 5-10 minute sessions of me approaching and getting some touches in a day. We won’t move on to anything else until he stops flinching and holding his breath when I touch him. Dakota consolidating leading, and grooming. A little less reactive about his legs. No-Name opened up a bit today. Less flinchy. More curious. We are starting to get somewhere. He walks toward me when I come into the pen, which is very important. He’s learned that is what he is to do, and is learning that I am displeased should he turn his backside on me. I’m working on building up his tolerance to having me next to him for prolonged periods of time. Today we spent a lot of still time together with my hand on his shoulder, his neck, his cheek as haltering preparation. We played with the halter a lot today too. He’s confident it won’t bite him, and has even been happy to allow me to slide it over his nose. Got a headcoller on No-Name mustang today. I worked for that one! We’ve been leading up to this all week with gaining trust and most of all him tolerating me being that close to him for more than a couple seconds. Even after we had established being scratched for a while, he has been nervous about me standing close to him. Things like putting an arm under his neck and staying there took a lot of work on trust, and most of all time. I could have got a headcoller on sooner using something easier like a rope halter but I decided to stick with the small, rather fiddly one I had started with. Doing so forced me to work harder with the fundamentals we needed to establish in order to get the thing on and fastened. Arm over head. Arm under neck. Having both sides of his face touched at the same time. Jingling of the buckle. But most of all, being close to me for long enough for me to slowly achieve these things. He found it very difficult for me to have two hands on him at the same time, so we had to spend a long time working on that. The first time I had it on and fastened today I was sure it had been a fluke, but we did it again and relatively easily later on just before feed time. No-Name’s name was chosen today by the hive mind of Facebook: Milagro. So, as you can see, two very different little horses to work with. Both wonderful and challenging in their own ways. It is important to me that nothing is done that forces them into doing what I want, but that it is their decision to follow me. Doing it this way takes more time, good communication skills, and a wheelbarrow full of patience, but it is worth it at the end of the day when understanding is met and trust is gained. We will continue to post updates on Milagro and Dakota on our Facebook page. Please consider donating to help us continue their care, and also rescue more mustangs.